I am using black sesame seeds because they have a more sweet and neutral taste compared to white. The color may not be so alluring, and is a little bit tricky in recipes since the color needs to have a purpose. In Chinese medicine, black sesame seeds are associated with the kidney and liver meridians. They function to strengthen Yin Jing and blood, moisten the intestines, and help build up the spirit. Yin Jing protects our youthfulness. According to traditional Chinese theory, Yin Jing determines how we age, quickly or slowly. Every day throughout our lives Yin Jing is used and must be replenished. Some more popularly mentioned Yin Jing booster are Goji berries and He Shou Wu. Sesame seeds have a wonderful nutty and sweet flavor with a little crunch. They are a yummy and unique addition to; soups, granolas, yogurts, smoothies, breads, crackers, energy bars, desserts, dips, breads, sauces, tonics, pasta dishes or salads. Like the more traditional white sesame seeds they are a good source of; calcium, fiber, protein, iron, phosphorus, magnesium and oodles of other things! If you are interested in learning more about the benefits of black sesame seeds specifically here is a great article by Real Farmacy. When making your own Tahini at home you may want to add honey, maple syrup, stevia, coconut nectar, date paste or whatever your preferred sweetener is. I prefer to keep it as is 🙂 Please feel free to add any spices like cumin, garlic or onion to the paste according to what will work with your recipe. Some other delicious additions are red peppers, olives, asparagus, fresh herbs like parsley, carrots or beets just to name a few! 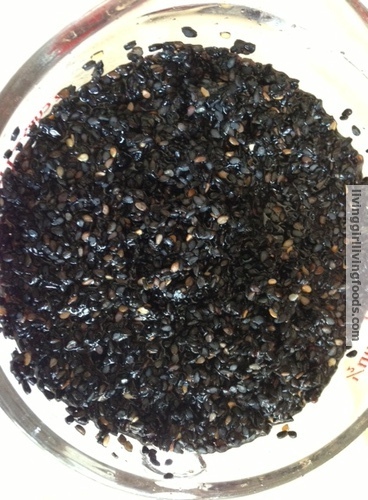 1) Soak 1 cup of black sesame seeds in filtered or spring water for 2 hours. 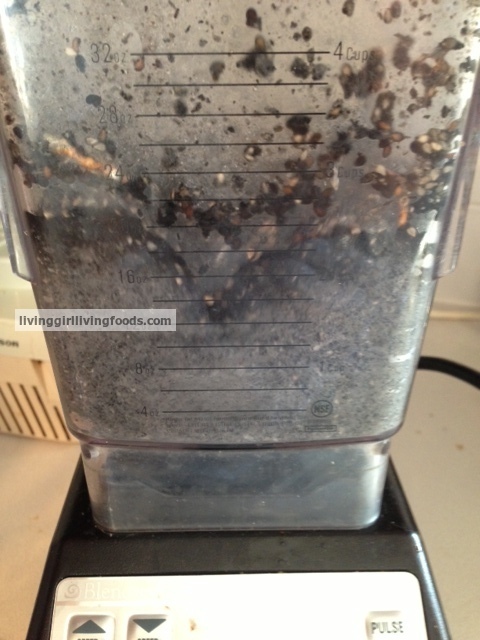 3) Place the seeds in a blender with a fresh 1/2 cup water and just a pinch of salt. 4) Blend until you have a thick, creamy paste. Stop your blender after a few minutes to scrap down the sides, this will give you a smooth creamy texture. By making your own tahini, butters, pastes, sauces and so on you can save money, form a high connection with your food and possibly yourself. These extra actions can make us appreciate just how much food, options and abundance is around us. Plus save us from pesky preservatives and ingredients that at least I personally have issues pronouncing. « “New Food” Finds <3 Red Gooseberries & Red Currants.